Introduction: journalists in Latin America continue to face numerous threats in the exercise of their journalistic profession, which has increased the concern of the international community over its protection in recent years. Methodology: The objective of this research is to analyse nearly 500 cases of murders and disappearances in Latin America from 2000 to the present, as well as to elaborate on a profuse bibliographic review of the main sources of information and national and international programs in this regard. Results and conclusions: The results show a considerable gap between the international willingness to create programs for the protection and fight against impunity, the complex and insecure national realities in the region, and the number of information professionals who died or disappeared violently in Latin America. Journalism; Latin America; aggression; violence; threats. 1. Introduction. 2 Methodology. 2.1. Safety of journalists and the question of impunity: the priority of the international community. 3. Results. 3.1. Women journalists: Few and invisible. 4. Discussion and conclusions. 5. Notes. 6. List of references. About half a hundred of journalists have been murdered or disappeared due to practicing their profession in Latin America in this century. Since 2000, aggressions not only have not reduced with the incorporation of new democratic systems, but they have intensified in complex national contexts characterized by violence, actions of multiple perpetrators and impunity. Precisely this last one is consolidated as “an incentive for whom use death as an authoritarian solution before public liberties of democracy” (Díaz Nosty, 2016a: 85). The objective of this research is to analyze 452 cases of murders and disappearances of journalists since 2000 until June 30, 2017 in Latin America, as well as to elaborate a profuse bibliographic review of the main sources of information and national and international programs about it. The absence of detailed studies about the regional reality of aggressions to Latin American journalists was one of the reasons for the creation of the Observatory for Press Freedom for Latin America within the Infoamérica project (infoamerica.org) of the unesco Chair of Communication of Universidad de Málaga. The alerts coming from freedom of expression entities regarding attacks against information professionals have worked as a basis to elaborate a historic catalog of more than a thousand journalists killed and disappeared violently in the last half of century. In 2016, the book Periodismo Muerto: más de mil periodistas asesinados en América Latina (1970-2015) [Dead Journalism: more than a thousand journalists murdered in Latin America (1970-2015)] was published(Díaz Nosty, 2016b) where there is a detailed pathway about the dangerous nature of the professional practice in the region. 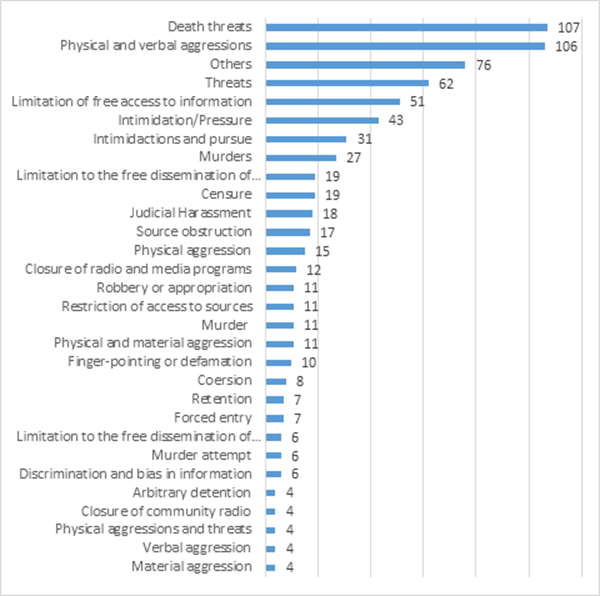 Starting from this effort on cases documentation, the media where these murdered and/or disappeared professionals of information worked in and the possible causes of their violent deaths, the purpose of this article is to delve into the almost half thousand cases since the beginning of the century until half of 2017, making visible the criteria divergencies of the most known organizations in data registry and their lack of monitoring by the corresponding national authorities. In particular, the data of the United Nations Organization for Education, Science and Culture (unesco) is used as reference, as well as Reporters without Borders (rsf), Committee to Protect Journalists (cpj), International Federation of Journalists (fip) and International Press Institute (ipi), besides national observatories such as C-Libre in Honduras, Cerigua in Guatemala or the work of Artículo 19 in México. The murder of journalists constitutes the “most extreme way of censure” (oea, 2008: 11). It is “the censure of fire” (Lozano and González, 2004) and, in spite of it, it is not the only one. Harassment and aggressions of all kinds, fear, lack of protection or impunity are perpetuated as tools to avoid the truth from being published. This dramatic situation has turned in a priority line for international organizations in the last years (Hughes et al., 2017, Badran, 2017), most of all, since the elaboration of the Action plan about journalists’ safety and the issue of impunity by United Nations (unesco, 2012). The Objectives of Sustainable Development, included in the Program 2030 for the Sustainable Development, foresee the creation of measures for the promotion of pacific, inclusive and fair societies with efficacious, responsible and inclusive institutions in the point 16, where there also outstands the protection of fundamental rights and publics’ access to information. Safety of journalists and elimination of impunity in the violation of human rights are essential components to achieve said goals. This international effort has not been corresponded with a reduction of aggressions towards information professionals, at least in Latin America, and neither with an increase of guarantees for the profession’s practice, as evidenced in deficits of national or international mechanisms of journalists’ protection. unesco adopted, in the meeting of the Executive Council on the past April 28, 2017, a new resolution about journalists’ safety and the issue of impunity, where all interested parties were demanded to double their efforts to guarantee professionals’ safety and stop the impunity of crimes against journalists. Even though the safety of media professionals is characterized by criminal deeds produced repeatedly from the south of Chile and Argentina until the north of Mexico, “the opacity, impact over media and creation of hostile situations for the professional practice” (Díaz Nosty 2016b: 86) hinder the task of tracing detailed information about cases. Often, the expansion of organized crime, corruption and prevalence of political expressions alien to the democratic culture hamper cases monitoring, with the disappearance of proof or the lack of rigorous and true statistics about individuals that have been victims of aggression during their professional practice (Díaz Nosty, 2016c). In front of this difficulty in data collection and the relatively scarce academic interest about such a relevant issue in the configuration of media systems in democracy (United Nations, 2017a, 2017b), it is mandatory to define methodological strategies that allow making the health status of press freedom in Latin America visible, as well as the situation of the protection mechanisms of journalists and the efficacy of the international effort for providing a critical multilateral system to the safety processes of information professionals. 2.1. Safety of journalists and the question of impunity: the priority of the international community. In the last years the international community has intensified the monitoring activities of journalist’s safety and the freedom of expression from different perspectives. Therefore, it is necessary that the different strategies could be analyzed from a bibliographic review of studies about professionals’ safety and the impunity issue, as well as a critical analysis of results of researches of national and international entities. At international level, the United Nations Security Council has adopted eight resolutions about journalists’ safety and, in 2013, the General Assembly declared November 2, as the International Day to end impunity of crimes against journalists. On its part, the High Commissioner for Human Rights (ohchr) elaborated different reports for the Human Rights Council of the General Assembly, through providing technical counseling for national authorities and the monitoring of violations against journalists, sensitization and education of information professionals. Source. Reporters without Borders (2015-2017). Authors’ own creation. unesco has led the process of creation and application of the Action Plan of United Nations about the journalists’ safety and the impunity issue, since in 2008 the general director of the organization, Irina Bokova, elaborated a biannual report. Even though this document provides an analytical vision about the situation of member States in the monitoring of journalists’ murders in their national territory (unesco, 2016), a protocol of public complaints was institutionalized and performed by the general director whenever there was a violent death of a journalist, which is usually published in the entity’s website . However, this case monitoring has not been accompanied by an increase in the budget of countries belonging to these entities for the journalists’ safety, and as a last resort, this international emphasis in the protection of information professionals has not corresponded with the reduction of the number of aggressions. Governmental entities are not the only ones that have concerned about these issues. With relative reliability (Díaz Nosty, 2016a, 2016b; De Frutos, 2014), specific non-governmental organizations set most of Latin American nations aside to positions of absence of freedom, typical of authoritarian governments, in the annual rankings they elaborate. This is the case of Reporters without Borders. Out of the nineteen countries analyzed in Latin America for this study, rsf positions most of them in the second half of the table in their ranking of 2017 : Bolivia (107), Brazil (103), Colombia (129), Cuba (173), Ecuador (105), Guatemala (118), Honduras (140), Mexico (147), Nicaragua (92), Panama (96), Paraguay (110), Peru (90) and Venezuela (137). Only Costa Rica (6), Uruguay (25), Chile (33), Argentina (50), Dominican Republic (59) and El Salvador (62) were positioned in the upper positions (Table 1). Freedom House is another of the entities that analyze press freedom in the world. This North American organization, created in 1971, promotes a classification that has changed its methodology in different occasions and which splits countries into three main buckets. In the case of Latin American States studied, in 2017 two of them were considered as “not free” (Cuba, scored 15 and Venezuela, 30) and the rest were divided into “partially free” (Bolivia, 68; Colombia, 64; Ecuador, 57; Guatemala, 54; Honduras, 46; Mexico, 65; Nicaragua, 47; Paraguay, 64 and Dominican Republic, 68), while eight were considered “free” (Argentina, 82; Brazil, 79; Chile, 94; Costa Rica, 91; El Salvador, 70; Panama, 83; Peru, 72, and Uruguay, 98) (Table 2). The creation of chronological series about press freedom in general and about attacks perpetrated against journalists in particular is complex and, as observed in the cases of rsf and fh, it might sometimes raise serious methodological doubts. Although other attempts have been promoted, such as the disapproval of the general director of unesco regarding murders of information professionals, there is no unified record of killed and forced disappearances in the profession’s practice in Latin America. Likewise, “it is confirmed that the specialized organizations stablish statistical inclusion criteria that, even though they are similar, they differ in the number of cases considered” (Díaz Nosty, 2016b: 35). The disparity of data and interpretations about press freedom, journalists’ safety and the impunity issue lead to the creation of the Observatory of Press Freedom for Latin America in 2005 (www.infoamerica.org). This initiative nurtures from alerts by different organizations that monitor the free practice of the journalism profession and has gathered information of about 1.100 violations since 1970 until today so far. *In 2015 there was no total score. Source: Freedom House (2015-2017) Authors’ own elaboration. Taking this monitoring activity as reference, 452 murder and forced disappearances cases of this century have been reviewed, paying special attention to the causes of aggressions. The detailed analysis of these attacks allows observing clear trends in these 17 years. The beginning of the century has not improved the journalists’ safety in Latin America, although international attempts for monitoring aggressions and press freedom have increased, as well as the creation of mechanisms, both national and international, so that different agents involved achieve agreements. Between January 1, 2000 and June 30, 2017, 452 murders and forced disappearances of journalists in Latin America have been identified (tables 3 and 4). Unfortunately, “what could seem like a result, strongly nurtured by the years of military dictatorships and armed fights, far from the scenarios of democratic stability, is refuted by latest years’ data, which emphasize the dramatism of crisis” (Díaz Nosty, 2016a: 91). Mexico continues to be the most dangerous country to practice the journalistic profession in the region (González de Bustamante and Relly 2017, 2016; Hughes and Márquez Ramírez, 2017), with 163 dead journalists in these 17 years. Since 2006, the number of information professionals murdered in the North-American country has increased considerably, coinciding with the fight against drug trafficking (Relly and González de Bustamante, 2017 2014). The creation of the Special Prosecutor for Crimes against Freedom of Expression (feadle) and in 2012 the creation of a mechanism of protection for defenders of human rights and journalists  have not improved said situation. In fact, different organizations have reported that no “effective assistance to journalists under risk is provided and demand to strengthen prevention to avoid fatal attacks” (cpj, 2017: 37). Source: Observatory of Press Freedom for Latin America by Infoamérica. Authors’ own creation. The lack of efficacy of this mechanism was evidenced the past August 22, 2017, when the journalist Cándido Ríos, 'Pavuche', who was part of the mechanism of federal protection and who reported threats on countless occasions, was murdered in the State of Veracruz. Another case with great international repercussion was the violent death of the photojournalist Rubén Espinosa, 31 years old, in August 2015, who reported to undergo threats before his disappearance. According to Artículo 194 , it was the first time that an internally displaced journalist was murdered in the City of Mexico “The violence Espinosa suffered was publicly known, therefore the homicide of the photoreporter took place without authorities responsible for protecting journalists in this country moved a single finger in favor of Espinosa” (Artículo 19, 2015). *Data of 2017 until June 30. The peace agreement signed one year ago between farc and the Colombian state still needs to give results since threats and aggressions towards information journalists are happening, although no journalist was violently murdered during the studied period , In spite of it, aggressions are diverse and violations of rights of information professionals are still being committed, as recorded on the monitoring made by the Foundation for Press Freedom (flip). As novelty, in 2017 flip documented cases of attempts, espionage or invasion, harassment or even robbery of material to journalists. *The item «sexual violence» was eliminated from the table because there was no incidence. Source: flip (2006-2017) Authors’ own creation. The increase of violent deaths of professionals in Honduras is specially concerning in the last years. Besides the 59 murders and aggressions, there have been displacements and migrations of information professionals that, under extreme cases, have even been pursued abroad. Such as the case of Edwin Rivera Paz’s murder, a 28-year-old journalist, who took refuge in Mexico after the murder of his colleague, Igor Padilla. The organization C-Libre , Commission for Freedom of Expression, promoted a campaign to create an alert and protection mechanism of the civil society “because impunity, total absence of research processes and access to justice, have made the practice of journalism and social communication more vulnerable” (C-Libre, 2017). As a result, the Alert and Protection for Journalists and Social Communicators of Honduras (rapcos) emerged in 2009 which articulates a visualization of the main data collected in Honduras since 2012 (Table 6). Source: C-Libre (2012-2016) Authors’ own creation. With 57 victims, Brazil is the fourth country with more journalists killed in Latin America. The political changes in the last years and the citizens’ protests have been widely treated in public, private and communitarian media, increasing the vulnerability of information professionals during coverages. The year 2015 was particularly outstanding, since nine information professionals died. Guatemala, with 32 deaths and disappearances of journalists during the 17 years studied also offers an environment of structural violence that directly impacts information professionals’ safety. The Centre of News Reports about Guatemala, Cerigua, started the campaign in favor of a protection program of journalists in 2011, “before the constant events of violence, threats, physical and verbal aggressions, as well as other violations of journalists’ rights in Guatemala”. On May 3, 2012, the Guatemalan government announced the enforcement of the program with numerous irregularities, as the organization itself complaints , which have not avoided that aggressions against journalists continue (Graphic 1). *Given the number of aggressions, we have omitted from the graphic the types that only had one or two aggressions in the total count. Source: Reports of the Situation of Freedom of Expression in Guatemala (Cerigua, 2003-2017). Authors’ own creation. Even though the number of dead and disappeared women journalists in Latin America is inferior to their workmates, 22 women against 430 men murdered in this century, unesco will alert in its next report titled Journalists’ Safety and The Impunity Issue the need that governments and organizations talk about safety of information professionals transversalizing the gender perspective. This document is being conceived at the dawn of the report form the General Secretary of uno about women journalists’ safety and the impunity issue (United Nations, 2017b) and the resolution 70/162 of the General Assembly of the uno, about safety for women journalists, which recognized the specific risks of these professionals in the practice of their task and highlighted the relevance of using a gender approach in the measures to ensure their safety (United Nations, 2016). Between 2000 and 2009 ten women journalists were murdered in the region, two in Colombia and Mexico and one in Brazil, Costa Rica, Nicaragua, Paraguay and Venezuela. Between 2010 and half of 2017, therefore in seven years and a half, 13 women died violently while working as journalists in Latin America, more than in the complete previous decade, concentration eleven of these cases in Mexico. This number turns the North American country as the most dangerous to practice the profession currently (table 7). In fact, aggressions to journalist women in Mexico have increased 70% between 2014 and 2015 compared to the previous two-year period, in a period characterized by the diversification of attacks and the inefficacy of researches, as complained in the last report of the Communication and Information Agency (cimac) The power of chiefdom, presented at the end of 2016 (cimac, 2016). The gender perspective is one of the main deficiencies identified in the tasks of international and national entities about journalist’s safety and the impunity issue. From the countries analyzed for this study, the protection mechanisms of individual’s defenders of human rights and journalists of Mexico is one of the few that, since 2012, incorporates the gender approach, both in the prevention as well as in the protection of cases, trying to recognize the specific risks women information professionals must face. Nor researches of entities such as cimac (2017) nor the cases of murders and disappearances of journalists women seem to confirm such progress. On January 9, 2016, a collaborator of El Sol de Orizaba, Ana Flores Salazar, was murdered, as well as the journalist of La Jornada in Chihuahua and collaborator of El Norte de Ciudad Juárez, Miroslava Breach Velducea, 54 years old, murdered on March 23, 2017 due to reporting cases of political corruption, human rights abuses and aggressions of the different cartels in the region. The detailed analysis of the 452 cases of murders and forced disappearances in Latin America from the start of the century until half of 2017 allowed to characterize a critical situation determined by the multiplicity of perpetrators, insecurity of information professionals and a permanent impunity scenario that perpetuates these vulnerability conditions. Mexico, Colombia, Honduras, Brazil and Guatemala are the most dangerous countries for the professional practice during the first 17 years of the xxi century. Even though murder is the extreme way of make an attempt against the freedom of expression, harassments and aggressions of all kind, the fear, lack of protection or impunity perpetuate as tools to avoid truth from being published. This melting-pot of violations of the rights of information professionals has tried to be corrected by the international community without success. In the last years, the resolutions and specific plans about journalists’ safety have multiplied, as well as the impunity issue, without reducing the number of aggressions in the Latin American region. The great variety of observatories of freedom of expression and press freedom have generated a vast amount of information that, in few occasions, is analyzed using a critical spirit. Different entities, such as Freedom House or Reporters without Borders, elaborate world rankings using changing variables and methodologies, which alter final results. These modifications rarely reach citizens, who use said information direct or indirectly to know the status of freedom of expression in the world. The international will has not been corresponded with a reduction of aggressions, at least in Latin America, nor by an increase of guarantees for the practice of the professional, as evidenced in the deficits of protection mechanisms of both national or international journalists. In this sense, it has been confirmed that the protection mechanisms of defenders of humans rights and journalists enforced by Sate agents do not only ensure serious economic and political difficulties, which affected its independency, but that as last resort, they have become devices of governmental propaganda without a true will for protecting victims. Cases like the mechanisms created in Mexico and Honduras illustrate these kinds of hurdles. The gender perspective in the processes of protection of journalists and the impunity issue is one of the major deficiencies identified both nationally and internationally. In fact, the last initiatives of unesco reveal the concern for making visible the specific risks suffered by information professionals in their professional practice. Even though some national observatories use this gender perspective, the invisibilization of these situations must be corrected in the Latin American region as well. As conclusion, the critical analysis of the cases of aggressions against journalists in Latin America in the xxi century confirms the urgency of creation and monitoring efficacious safety measures for these professionals in the region, otherwise the democratic pillars in regards of the right for life, the freedom of expression and right to information would be violated. * This paper is part of the proposal cso 2017-84820-P “Press freedom, journalists’ safety and impunity in Ibero-America. Academic transfer and democratic culture”, of the Program of Projects of the State Agency of Research from the Ministry of Economy, Industry and Competitiveness. This paper only used the data of 2015, 2016 and 2017 of Reporters without Borders since, as the organization itself explains on its website, the methodology of analysis in those years is the same for that three-year period but different from previous years and, therefore, needed to use an ad hoc methodological strategy to make “a better comparison between one edition and the other”. “Since 2013 the final score is defined with a scale ranging from 0 to 100. 0 represents the best note and 100 the worst. rsf calculates two scores.” (rsf, 2017). To consult more information about the mechanism see http://imdhd.org/MecanismoF/index.html. [6 ]Even though no woman journalist died violently during the first half of 2017 in Colombia, the past October 8, Efigelia Vásquez Astudillo, aged 31, journalist of the communitarian broadcast channel Renacer Kokonuko was murdered while covering the confrontation between the police and the indigenous movement happening in the municipality of Puracé, in the Colombian department of Cauca. Universidad de Málaga will grant on December 15, 2017 the VIII International Award of Press Freedom to C-Libre, in a ceremony where there will be special mention to the Mexican journalist Carmen Aristegui. Agencia de Comunicación e Información (cimac) (2016). El poder del cacicazo. cimac: Capital Federal. Badran M. (2017) “Violence against Journalists: Suppressing Media Freedom”. En: Friedrichsen M., Kamalipour Y. (eds) Digital Transformation in Journalism and News Media. Media Business and Innovation. Springer: Cham. DOI: https://doi.org/10.1007/978-3-319-27786-8_31. Online ISBN: 978-3-319-27785-1. Cerigua (2017). Informes de Situación de la Libertad de Expresión en Guatemala. Varios años.http://cerigua.org/publicaciones/informes-libertad-de-expresion. Díaz Nosty, B. (2016a). Periodismo muerto. Más de mil periodistas asesinados en América Latina (1970-2015). Ciudad de México: Planeta Editorial. Díaz Nosty, B. (2016b). “Medio siglo de atentados contra periodistas”. Infoamérica. Revista Iberoamericana de Comunicación, núm 10, pp.87-113. Díaz Nosty, B. (2016c). “Medio siglo de agresiones a periodistas. Síntesis estadística de asesinatos y desapariciones en América Latina (1970-2015)”. Contratexto, núm 24, pp.171-201. Freedom House (2017). Informes de la Libertad en el mundo. Varios años. Hughes S., Mellado C., Arroyave J., Benitez J. L., de Beer A., Garcés M., Márquez-Ramírez M. (2017). “Expanding influences research to insecure democracies: How violence, public insecurity, economic inequality and uneven democratic performance shape journalists’ perceived work environments.” Journalism Studies, 18, 645-665. Lisosky J. M., Henrichsen J. (2009). “Don’t shoot the messenger: Prospects for protecting journalists in conflict situations”. Media, War & Conflict, 2, pp. 129-148. Lozano J., y González, J. (2004). La censura del fuego. Bogotá: Intermedio. ― (2017b). La seguridad de las periodistas y la cuestión de la impunidad. Informe del secretario general de Naciones Unidas. Agosto 2017. ― (2016). La seguridad de las periodistas y la cuestión de la impunidad. Resolución 70/162. 10 de febrero de 2016. Organización de Estados Americanos (oea) (2008) Estudio especial sobre asesinato de periodistas. Washington: oea. Relatoría Especial para la Libertad de Expresión. Relly J. E., González de, Bustamante C. (2017). “Global and Domestic Networks Advancing Prospects for Institutional and Social Change: The Collective Action Response to Violence against Journalists”. The International Journal of Press/Politics, 19, 108-131. Link. Reporteros Sin Fronteras (rsf) (2017). Clasificación de la libertad de prensa en el mundo. Varios años.https://rsf.org/es/clasificacion#. Article received on 4 September 2017. Accepted on 6 November.